While we were in Kentucky we stopped by our friend Brad’s house in Richmond, Kentucky. Brad is a fellow owner of another Argosy 20 motorhome. His is a 19. He believes that his may have been one of the first ones made, possible even THE first one made. 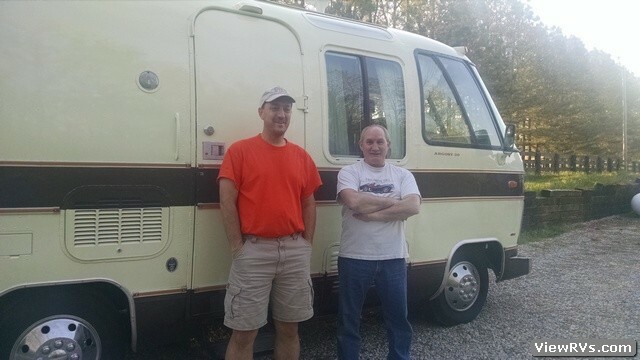 Brad knows far more than we do about mechanical workings, and he is in the process of rebuilding and remodeling his Argosy 20. He is a great guy, and we had lots of fun stopping by to see him. The next day after seeing Brad in Kentucky we went by and saw another friend of ours, Gary, in Corbin, Kentucky. Gary is another fellow RVer. 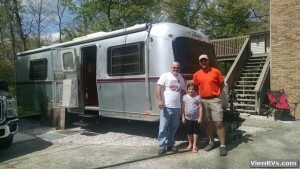 He has a gorgeous 19 Avion travel trailer and he actually just purchased a fifth wheel that he and his wife plan to full-time in one day. 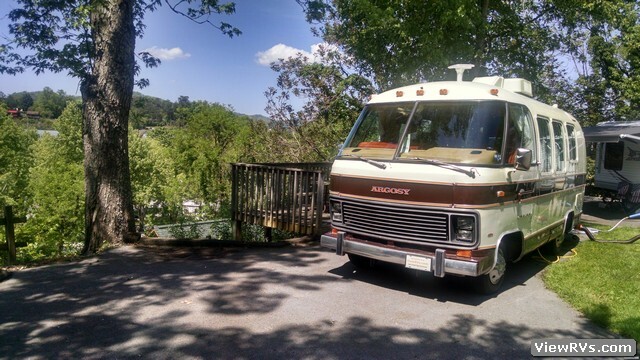 We originally met Gary and his wife, Susan, at a Vintage RV rally in the Smoky Mountains. Susan was out of town so we were not able to visit with her, but it was great to see Gary, and we appreciated his warm hospitality. 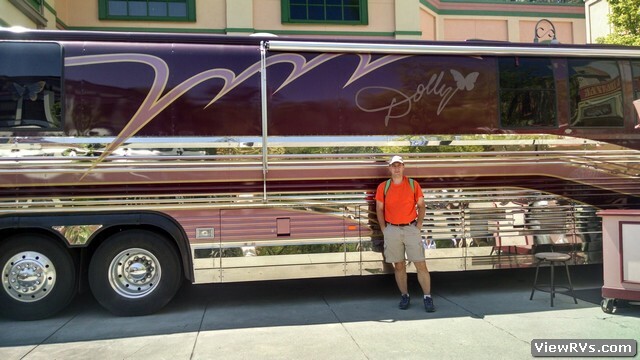 Fellow RVers are like having extended family spread all across the country! After leaving Gary’s we headed to Cumberland Falls State Park Campground just outside of Corbin, Kentucky. This campground was very very small and super crowded. We decided not to stay there and drove on to Pigeon Forge, TN. We stayed at this trip’s first private campground, so it was very nice to have full hook-ups! We stayed at Foothill RV Park. It was a nice park with a few exceptions. See my review here in our ViewRVs.com forums section. On Sunday we bought tickets to Dollywood online and headed over to Dollywood to get a head start on the administrative process of redeeming the vouchers. It went faster than planned, so we decided to head into the park for a quick preview. 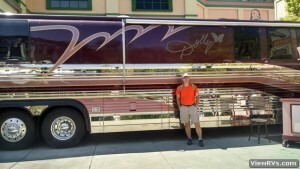 We ended up watching a live show, riding the train, and seeing Dolly’s Prevost tour bus! On Monday, we actually walked the 2-3 miles to the trolly depot where we caught a trolly to Dollywood. We had a great time and the weather was awesome. We watched another show, rode a few age-appropriate rides (LOL! ), and Fred had the famous Dollywood Cinnamon Bread! Yummy! Well, life does not always go as planned, so it is a good thing that I am trying harder to “roll with the punches” because our 30 day RV trip became a 15 day RV trip. I am writing this blog back at home because we had a family situation that needed our attention here at home. We loved our trip even with all of the “ups” and “downs”. We have decided that we really would like to full-time one day. Right now we are not at a point in our lives where this will be possible, but we hope to in two to four years. For now we will continue to take extended trips in our George. Our next trip is scheduled for next September, so stay tuned! This entry was posted in Articles, That Rolling 70s Show by Monique. Bookmark the permalink.